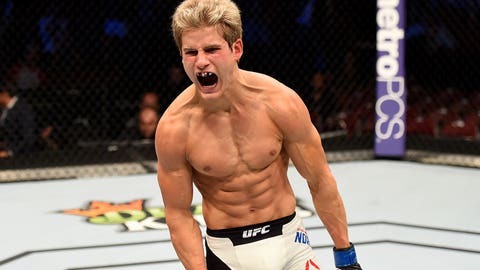 Sage Northcutt upon hearing that he'd get to meet and train with his hero, Georges St-Pierre, at the TriStar gym in Montreal. "I’m just going up there to check it out and see how it goes, see if it’s a fit for me," he said. "I’m just going to go up there for a week or so, check it out, see how it goes." Well, that and geek out on GSP. "I’m just excited to see him, even if it’s one day," he said of the former 170-pound king. "I always talk about how Georges St-Pierre is my favorite fighter. I look up to him, so I think it’s just perfect timing that I get to go down there and train with him and get to meet them. It’s going to be incredible." With all his fighting and traveling and hero-meeting, the Texas A&M freshman has realized that he can’t combine that with a full course load. So, he’s cutting back on his school work so that he can make the most of his UFC opportunity. "I might take a break," he revealed. "Right now, from the first semester, I was taking full-time classes. Now that I’m in my second semester, I noticed that I’m getting to fight for the UFC. Having full-time classes, it doesn’t really work out because there’s so much workload and so much studying that you really don’t have time to train. "I’d stay up until two or three in the morning just studying and then I’d have to go get a few miles running, work out at the gym super late and try to get my working out in late at night." Northcutt went on to say that with more time to focus on fighting, he imagines that he’ll improve a great deal and soon be even more dangerous than he already is. "Now I’ve cut back on the workload. In the future, too, the more fights I go, you could possibly see me taking a break from school for the year, maybe two years. We’ll see how that goes. Then I think I’d be totally different because getting to train full time, it’s just going to be completely different."